LAGUNAS DE LAGUARDIA (castilla y leon) - VINOS LIBRES "just honest wines"
The DOC laws in Rioja limit wine production within the appellation. This forces many of the top wineries to sell their excess fruit outside of the DO. Bodegas Lagunas de Laguardia was created to capture the excess production of the best wineries in Rioja Alavesa. The wineries goal is to provide the best de-classified Rioja wines at an amazing value. 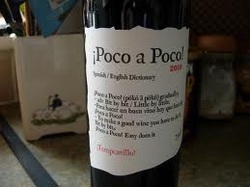 Poco a Poco is Classic Tempranillo from Rioja Alavasa. The wine is feminine with a soft fruit-forward nose with red fruit. Medium bodied with a soft easy-going finish. An elegant wine at a wonderful price!